What situation inspires you the most in the kitchen? It is when you have rested well and planned a menu in advance? Is it when you scurry home with a shopping bag full of exciting goodies? Is it when cooking for guests makes you drool in anticipation of what you are going to indulge them with? Think about it. In the meanwhile, let me tell you what gives me a kick. It has happened hundreds of times. As soon as I enter home, puff, my husband appears on the corridor. He isn’t, or hasn’t been, starving. It is a fact because I’ve prepared him a meal to enjoy while I was out. Yet, his first words are “I’m hungry.” They are spoken softly and come with a moist puppy look. All I’m thinking is “let me sit down for a moment!” My feet are killing me. I protest for a few minutes, take another look at the endearing orphan face he has become an expert in putting up and say “ok, I’ll fix something”. I take a shower to dust off the mental reluctance, dress clean, go to the kitchen and see that the light is about the most adventurous item in the fridge. What in the Earth I’m going to cook with nothing?! Then it hits me: this is my favourite situation in the kitchen! The feet maybe tired, but my brain is ticking. Ideas are shooting one after another. The breathing stabilizes and the heart opens up. A shade of red appears on the cheeks. Suddenly an eggplant, 3 tomatoes, a drop of olive oil, a sprinkle of yoghurt and a pack of flour are full of possibilities. Should I grill the eggplant? Should I braise it in tomato sauce? Should I make raita or salad? What about chapatis or puris? Within a nanosecond I’ve sieved through tens of options, weighted factors and made a choice. A quick pie it is. It is time to improvise. I’ve never understood the fuss about making pies. I stopped reading recipes when the alchemy involved caused me nightmares. The pie-neers must be the most uptight punch of bakers. Relax! Pie is just a crust with a topping of your choice. I like it rough. Grains are something to be chewed and crunched. You must taste the rain, the sun and the wind they’ve been exposed to when growing up. Their structure must remind of the soil and the sand; the intensity of the ground they have reached out from. Unrefined flour has these attributes. It is flavoursome and rooting. White flour sets you out of orbit. It has been robbed off anything but the element of air. The recipe I’m sharing is flexible for any kind of modification. It is a no-sweat snack with whatever grains, oils, herbs or vegetables you have available. You can add yellow cheese or feta to it, if you want it richer. Use your creativity to top the crust. Eggplants are best when nicely roasted and crispy, so try to place them on a single layer. You don’t want them to be wet and mushy. Sprinkle liberally with the spices and herbs. Bake in 225 C for about 20 minutes or until it looks wonderful. After taking out of the oven, give it a whip of olive oil and a sprinkle of plain yoghurt. It’s perfect! Love your interesting perspective on things -- like the eggplant shot. This looks like a fabulous and healthy lunch :). I'm so happy you started blogging, you're so inspiring. Each post is great. Thank you Xiaolu, Kankana & Alex! I admire and love yr food photography and yr recipes. But there is a small problem that is yr measuring dl, i search google but couldn't find out. Can u pls tell me or convert dl to...? Oh. sorry! My apologies. Dl refers to decilitre. I thought it is an international abbreviation but maybe it is something we use in Finland only. If you take a look at the sidebar there are two converters: measurement and temperature. Thank you for pointing this out! I have to improve the recipe-writing anyway, it is too obscure as it is. I hope this helps. Please let me know if you still have troubles. Excellent! Thanks for yr help. "Within a nanosecond I’ve sieved through tens of options, weighted factors and made a choice." Oh my. I do the same!!!! I start of with one idea and then it evolves as I look into the cupboards and then the fridge....and somehow it turns out completely different but so special! Madhu, thanks, you are a sweet personafied (appropriate to your name :-). I usually start cooking with a sheer panic without a single idea! Your cakes are a testimony of your creativity and cooking skills. All of your photos are gorgeous! What inspires me in the kitchen is beautiful fresh produce. I can't wait to get home and work out what to do with it to make the most of it. They say never go shopping on an empty stomach- well, I always do and manage to pick up random things that I know I don't need. At the end of the week, the produce that I've picked up that usually has no space in my pantry is what inspires me to cook! Can I come over for a slice of pie?! Jennifer, if we only had a small garden...maybe you do? Your comment lulled me into a daydream. Sukhaina, that's funny! Never shop hungry and always make sure the husband has eaten well before letting him accompany you! Two golden rules. Although in your case shopping on an empty stomach seems to turn out just fine. You are always welcome for a slice or a whole pie. I tend to make for daily food what I hav ein my pantry, but love whe I have guest then i canprepare a whole menu days ahead nad indulge them. I do bake my bread with spelt ( the bread we use daily for breakfast and evening) with spelt as hubby feel better with spelt than the pther flour. I ♥ everything in that post, including that sweet well known here moist (oh what a delicious adjective, that "moist") puppy look! Bravo! Oooh! Your eggplants looks like little bears! Yes, I agree with you about pies. It is surrounded by a lot of hoopla. :) I like your take on making an eggplant pie. Great recipe and beautiful pictures as always! what a beautiful pie. I want that! I should pinch Sukaina same pinch because that's exactly how I get inspired in the kitchen. But when you don't have anything on hand, that's an inspiring moment too. Best things come out of the kitchen at such times. Like this pie. Thank you for stopping by! Seems we all have similar experiences. ...should not be dreaming of snacks & pies at the moment but I do! Your photos & delightful writing have completely taken me with them! There are two aubergines, looking a little sad as they were not used when they were fresh, a couple of fresh tomatoes & Greek feta, oregano...few green peppers...sounds enough. I use spelt instead of white flour and might be brave enough to give this recipe a try. Oh..its raining eggplants and I am loving all that could be made with these humble veggie. I posted a guest recipe with eggplant :) Love the beautiful pictures. 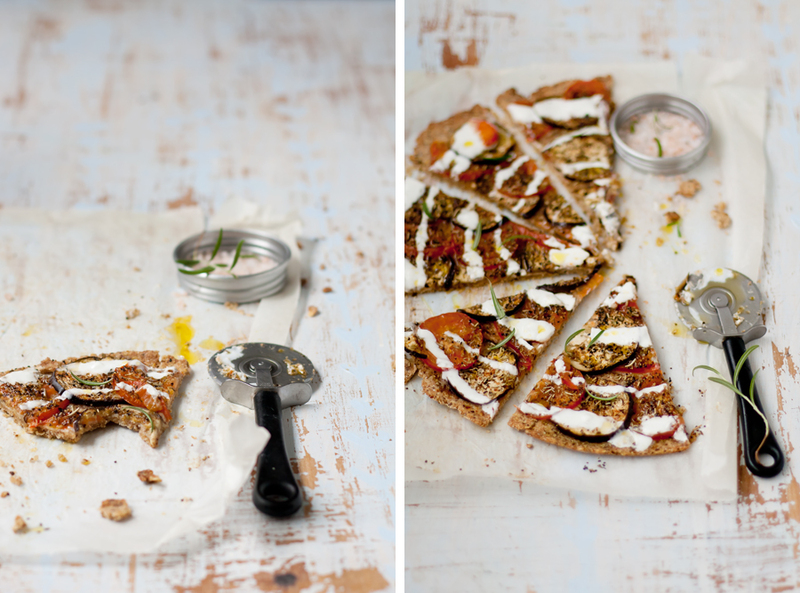 And how healthy the recipe is..with spelt and wholewheat crust, simply awesome. You have such a beautiful, beautiful blog. I can't but keep myself browsing post after post. My first time here and I am wondering why it took me so much time to get here. Oops I almost forgot, I love the way you write about food. Can spelt flour be replaced with whole wheat flour here? Anushruti, thanks for your interest. Yes, any flour can be used instead of spelt. I use spelt (for everything) because of the nutritive value and taste. It is lighter than wholegrain wheat. I just love the way of your writing! It is like listening to a story and I can visualise everything that the narration has got! i.e the 'puff' etc.. :) :) Love your website! ok..great! We don't get spelt here...I wish! Love your pizza cutter! Did you use thinly sliced raw vegetables over the pie crust before putting it to bake? And you don't pre bake the crust before topping it with vegetables? The vegetables and pie crust are raw and cooked for 20 minutes? Yes, the veggies are thinly sliced and the crust is thin as well. It might take a little longer than 20 minutes. No pre-baking needed. I'm sorry to ask, but isn't your husband able to cook himself a meal? I think it's very rude to ask the wife for a meal the moment she enters the house. Love your blog though, and the energy it is spreading. Con - LOL! No, my husband doesn't know how to cook. I love to cook for him, even when I'm tired. I may protest for a while though, but in the end I don't mind. There is nothing better than making someone else happy. Okay, of course you're right with that last statement! I'm sorry if I've been rude. Oh sorry, Kon, for spelling your name incorrectly! It was unintentional. I'm on holiday :-). my inspiration comes from the paradise i am blessed to now call home... the pacific northwest region of the united states. my local farmer's market is always so very full of choices that i find myself mentally cooking at my stove even before i finish shopping. the walk back to my apartment with my furry best boy is a full-on mind trip of possibilities that i did not consider while at the market. the air here is so fresh and clean + the temperatures throughout the year are spectacular (for me) + the atmosphere and vibe are always so pleasant = i almost always end up sitting at one of the parks i pass to just relax and hang out with my boy and other dogs. by the time i enter my doorway, i usually know exactly what is going down. i start up my music player, spoil myself with a quick pour of red, tear off a piece of baguette with a bit of cheese, then run off to the kitchen closely followed by my boy. by the time i finish playing around, that which sits on my plate is not at all what i had in mind; the ingredients always seem to have a life of their own. not too long ago i had to separate from my family to keep myself safe so i now cook for one and that turn of events seems to have crept into all corners of my day... free-style moments from start to finish.